Is everyone else in the throws of holiday decorating right now? I know I am! And even though I have been busy busy busy, today’s tutorial is something I threw together LAST NIGHT in less than 20 minutes! It was the ‘perfect storm’ that actually brought it together. I was setting up the tree and decorating my living room and realized I didn’t have a decent Christmas pillow to go on my dark brown club chair. I had a small square one, but I wanted something bigger and brighter that would stand out against the dark (faux) leather. And, in what happens to be a fortuitous twist of fate, I also recently pulled an old cable knit sweater out of the dryer only to realize it had a big latte stain on one of the shoulders. The writing was on the wall. 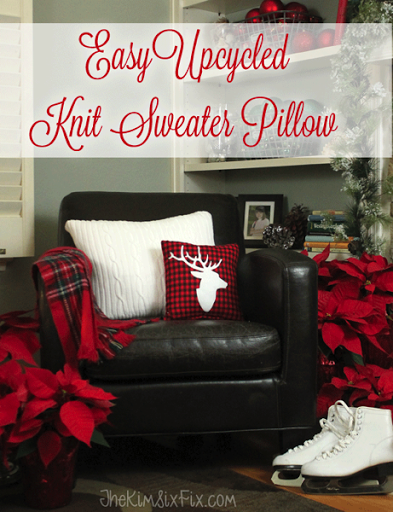 Turn that sweater into a throw pillow! Of course! The process couldn’t be easier. You really only need to sew two straight lines.. nothing else. If the sweater had been a scoop or boat neck, I could have made a square pillow. Because I had to cut my lower, it ended up being rectangular, which was pretty cool actually. The perk of cutting it this way is that the sides are already sewn together and the bottom edge is already finished. Next (leaving the sweater inside out) sew the CUT EDGE closed. Now you need to sew the other side closed. But we are in luck! That is the bottom edge of the sweater, the finished edge, so you can use an exposed seam. To make sure the edges didn’t warp or stretch, I pinned them together, and then ran them through my sewing machine, keeping the seam and close to the edge and as even as possible. Here is what it looked like finished. Sure, it isn’t a perfect finished edge, but I knew I would put that side of the pillow down, so it didn’t really matter much to me. It certainly looks like a high end pillow if you ask me. I love it! But if you have an old sweater lying around (or can find one at the thrift store), I challenge you to try this. You don’t have much to lose!